Day Seven: Two caves in one day! Are you mad?….. The final day of waking up in my luxury double bed arrived, for the next two nights I now had to suffer the pit of hell. Both Webbs had done their time and Thuggo had put in some time, so it was left to the organizer and leader to eat the peach as Bloomster refused to allow me any reward for my efforts and give his bed up for the ill Webbo instead. Never mind. 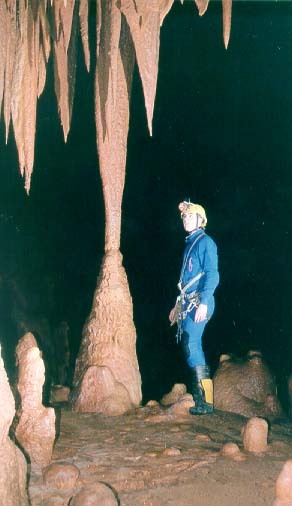 So, off to Torres Novas to get some floatation devices for Steve for the Lake of Doom in the Lomba, then a quick dash over to the Peno for some monster chamber action, circling the cave on fixed ropes, naked except for cows tails and helmets, taking pictures at every turn. Simon spent hours talking to the beard who turned out to run the karst national parks in Portugal. 2 hours later we were stood over the entrance to the Lomba watching Webbo bash the first bolt of the day in. Thuggo, Bloomster and myself all agreed that the Lomba could wait until the next PISS PT, so returned to the villa. Needless to say, after 2 hours of drinking beer in the sun I was well bored and wished I had gone to do battle with the Puritan boys, still, Misery Mason would be proud ! 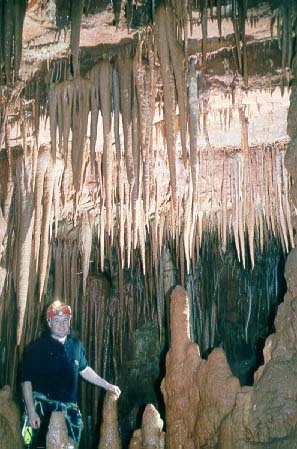 Top cave, too much fanny batter. Fantastic crystals upstream - had anyone ever been there? Little and big fanny batter passages were whoppers - the most stunning phreatic passages I've ever seen. View on exit was a velvet night sky studded with the stars and a silver shimmering moon reflecting off the evening waters of the Mira Minde.